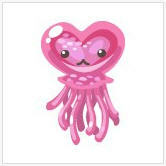 Pet Society releases what will be the first of many Valentine's Day specials -- a pink, heart-shaped jellyfish. This is just one of several new Valentine fish in the pond. To catch the jellyfish and the rest of the Valentine fish, you will need to buy Valentine's bait in the Cash Store, which cost 3 Playfish dollars each. Love might be in the water (according to a sign in the store) ... but it certainly doesn't come cheap! The Valentine bait will only be around until February 14, so avid collectors should hit the fishing hole ASAP. Let us know how many Valentine fish there are and how many biscuits you needed to catch them all!